Blue Artichoke Interiors: You Just Have to See This Beauty!!! 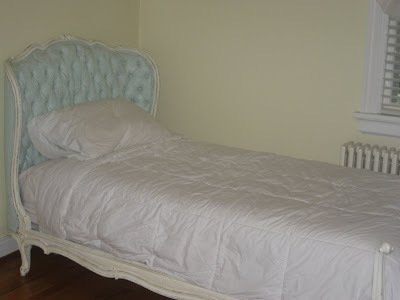 What Cassie from Primitive & Proper did with her $50.00 Craig's List bed was beyond beautiful. Take a look and enjoy! Hello there! I am Cassie from Primitive & Proper and I am so excited to be here today on The Frugal Designer. Like Rayan, I love anything design related, but always on a mindful budget. I am married to a wonderful man and we have 2 children we adore, and 2 dogs we love as well. So in our house of little ones and pets, we need durable and cost-effective furnishings and decor. When I began decorating my own home after we moved in a few years ago, I decided that distressed furniture was the way to go sine my kids do plenty of distressing on their own. This way any damage they do fits right in. 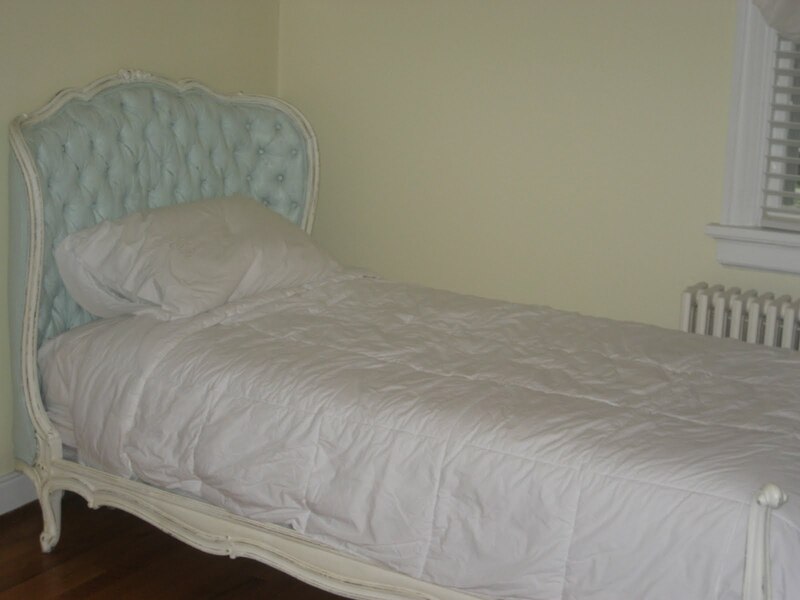 While working on my own home I discovered I loved rehabbing furniture and a business was born! The bed I am about to show you was purchased by me to work on, but a client saw it, fell in love, and wanted it custom finished for her. I was more than happy to oblige! Before my client saw the bed, my plan was to paint the frame aqua and the upholstery cream. She loved those colors, but wanted to opposite scheme, so the frame was painted a lovely cream color (Eggshell l Cream by Behr). I did not tape anything off- I rarely do that. I believe that with a good quality angle brush and a steady and careful hand, tape isn't needed. Just ask my husband- I do all the edgework painting in our home for that reason. And also because I find putting tape on the ceiling to be a daunting task. Anyhow, once the frame was painted I got to work on the upholstery. I would have loved to have reupholstered it in some fantastic fabric, but I don't yet have that skill, so I decided to try fabric painting. I purchased textile medium at Michael's. It's made by Deco-Art. I followed the instructions and mixed 1 part paint to 2 parts medium. I didn't use the FolkArt paint they suggested though, and used Behr Aqua Smoke. The textile medium needs to be mixed well with the paint prior to using. The consistency will be much more watery than paint, and the color will lighten a bit. I brushed on the first coat, and was so Happy to see the grease stains fading away! 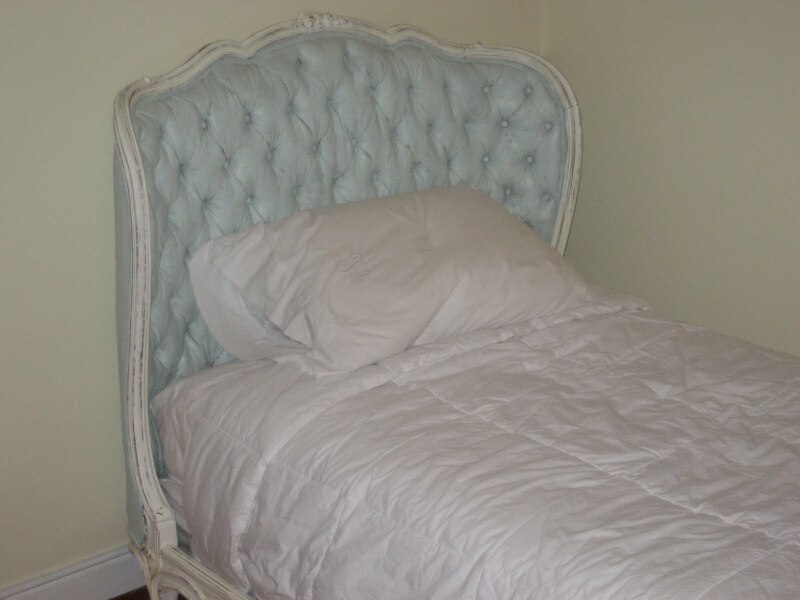 This bed had been in a boy's room all his life and when I purchased it from him as a now grown man, he chuckled at how greasy his head must have been. The fabric on the bed was a jacquard, and the pattern still showed through the paint. I didn't mind this at all and thought it gave it the glamorous look it deserved. I ended up putting 3 coats overall and was thrilled with the look. Once the paint was dry, I used a hair dryer since it needed to be heat set and the headboard wouldn't fit in my clothes dryer. The textile medium was easy to work with. It is a bit see-through, and has a little bit of a stiffer feel when dried, but it worked beautifully. Don't you think? I was honestly so tempted to tell my client the textile medium failed just so I could keep the bed, but that would be dishonest, now wouldn't it? So for less than 10 dollars worth of textile medium, and some paint I had on hand, the bed got an entire new look without the intense labor and cost of re-upholstery! Thank you so much Rayan for letting me share with your readers today! Hope you learned something new and come visit me soon!